Nina Johansson is a good girl living an unremarkable small town life. She might be young, blonde and blessed with an Amazon frame, but what does any of that matter? Her job as a bartender at the local nightspot barely pays the bills. And her crush on one of the bar’s regulars, the lean and sinewy Seamus Fitzgerald, seems to be going nowhere. All that changes in one night. Another boring evening behind the bar turns ugly when Seamus gets into it with a belligerent and muscular rival. Nina gets caught in the middle and finds herself bleeding and woozy on the floor. The night takes an unbelievable turn when Nina wakes up in a cabin in the woods. A concerned Seamus is at her bedside. Seamus reveals his incredible secret to Nina. He is not only a “shifter” – a modern-day werewolf who can shift into wolf form at will – he is also the Alpha leader of an entire pack of shifter-wolves… seemingly ordinary men and women with the same remarkable powers! Nina can scarcely take all of this in when Seamus reveals the craziest mind-bending truth of them all… the same shape-shifting powers lie dormant within Nina too! Seamus teaches Nina to access and harness the shifter power within her own body. Soon she too runs wild and free under the moon… a sensual wolf… alive and awake for the first time in her entire life! As the Alpha, Seamus has his choice of the pack’s females. He selects Nina as his mate. Nina finds herself thrust into the role of the pack’s “Alpha female” to the resentment and envy of every other woman in the group. Nina and Seamus fall deeply in love. They love as only wild animals can… with urgency, with blazing passion, with no thought of tomorrow. But Nina’s surreal new life quickly takes a dangerous turn for the worse. A dark-hearted rival emerges to Seamus and leadership of the pack. With Machiavellian ruthlessness and cunning, he plots to destroy Seamus and to take Nina as his own prize. What happens next? You’ll just have to read that for yourself. You can count on fiercely creative author Alice X to provide you with all the romantic suspense that you can handle. And all the unexpected twists and turns that you love! 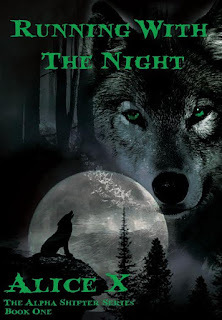 Start reading Running With The Night – The Alpha Shifter Romance Series Book One - today!